Okay, so the headline of today’s post is a little misleading. The Legal Genealogist — daughter, granddaughter, and great granddaughter of Texans born and bred — really is well aware of many of the fabulous digitized resources for researching Texas history and genealogy. From the map collection at the Perry-Castañeda Library of the University of Texas at Austin to the Handbook of Texas Online at the Texas State Historical Association, there are some neat online Texas research portals. But there’s a new one, and that’s big news! Portraits of people, photographs of buildings, street scenes, homes and events, even a collection of more than 1,400 postcards and picture postcards from southeast Texas make up the collections. Civilian Conservation Corps Drawings: Searchable database to over 3,900 large-format drawings documenting park development and construction activities by the Civilian Conservation Corps in Texas from 1933-1958. Fire Insurance Maps: Searchable database of fire insurance maps and/or Sanborn maps listed by the location mapped. The maps date from the mid-1920s to the 1970s. Map Collection: Searchable database to original, photoreproduced, and compiled maps of Texas covering the period from the 17th-20th centuries. Republic Claims: Searchable index of Comptroller’s records submitted by citizens to the Republic of Texas government from 1835 -1846, including claims for payment, reimbursement, or restitution. It also includes records relating to Republic pensions and claims against the Republic submitted as public debt claims after 1846. Republic of Texas Passports: Alphabetical listing with images of records relating to individual passport files in the Republic of Texas, including requests for passports, orders to issue passports, and one proclamation granting entrance to the Republic. 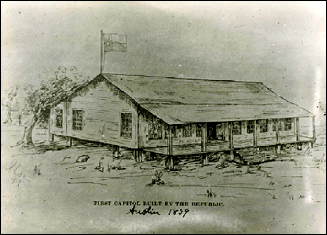 Texas Adjutant General Service Records, 1836-1935: The Service Records series combines both official service record files from the Adjutant General’s Office and alphabetical files created by other agencies that contain records related to an individual’s service in a military unit. The information contained in an individual’s file varies considerably. So check out the new Texas Digital Archive and all of the online resources of the Texas State Library and Archives Commission. Image: First Capitol Built by the Republic. Austin, Texas. 1893- . Drawing by Ilse. Prints and Photographs Collection, Texas State Library and Archives Commission. All I need say is “Go Texan!” This is excellent news for Texas researchers of all kinds. Hey, this is really cool! My library is working with TSLAC right now to improve our digital repository with them (DSpace). Very cool group of folks. Oooh, I have a lot of Texans and quite a lot of missing records for them, so this is a nice development! I’m especially excited to hear about the Sanborn maps and the Republic Claims. What a great resource this will be. Thanks for getting the word out!